We look forward to exploring with you the sights, tastes, and sounds of the regions we travel. many pictures and articles online. The Bicycle Tour Company is a premier adventure travel company and cycling center, as featured in Connecticut Magazine, Philadelphia Inquirer and Cycling USA. 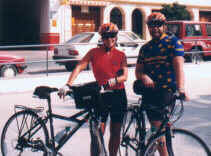 Our trips are the fruit of over twenty-five years of experience in the cycling industry. 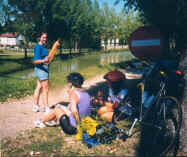 While traveling the globe as a bicycle tour leader and as a cycling professional with the Motorola and Saturn racing teams, I have met extraordinary people, who have become Bicycle Tour Company staff members. Joining our leaders are cultural guides who provide BTC trippers with unique historical perspectives and insider tours of our destinations. Thank you for fulfilling my fantasy to bike the countryside of France...You created an extraordinary experience for all of us. Many of us thought this was one the best trips we ever had...It's difficult to sum up a week so packed full of wonderful experiences and so much fun.